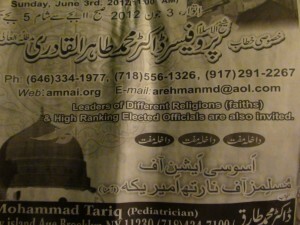 UPDATE: Muslims Rent out Sports Arena for MEGA Interfaith IslamoCON!! This is a quick update on the “Muslims Rent out Sports Arena for MEGA Interfaith IslamoCON! !” exclusive story. The first thing is that the link to the article has been Tweeted to (by numerous infidels), and posted on the Facebook page of the backstabber of America, Republican Congressman Michael Grimm of NY’s 13Th District (Staten Island). As of now he has not responded, and it appears he might just duck the issue. Secondly, I called the number in the ad that was placed in the Pakistan Post. A Muslim man answered, and I told him I am a non-Muslim who was interested in their “Peace for Humanity” conference. He asked how I knew about it, and I responded the Pakistan Post. He wanted to know how I understood the language. My reply was that the ad was in English also. Then he laid it on thick. Telling how me “good” I am, a for “God to bless me and my family”. For some reason he didn’t not mention the following verse from the Koran. He went on to tell me to bring as many people as I like, and closed with “this is what’s best for humanity”. Like I said, Muslims think they know what is best for us infidels. 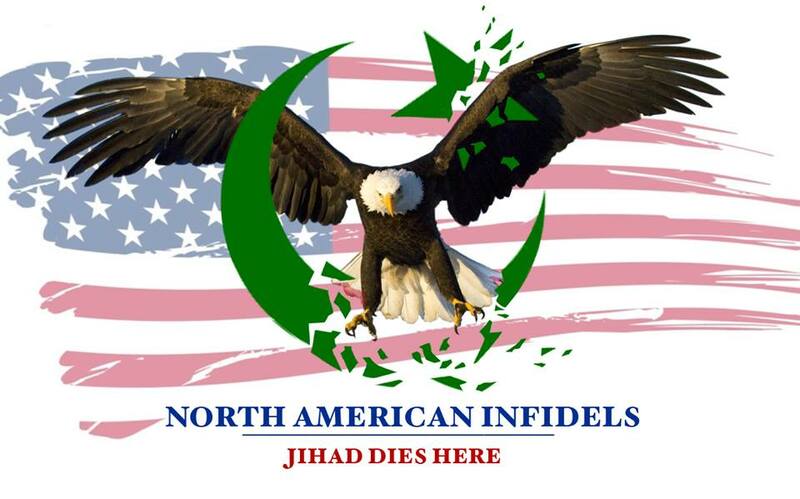 ← Logan’s Warning Exclusive: Muslims Rent out Sports Arena for MEGA Interfaith IslamoCON!! Thanks for keeping us warned. Really? That’s what’s “best for humanity”??? I suppose so, if you think humanity wants to live in Hell! It’s very clear to the 5.8 Billion non-muslims in the world that islam is Satanism. He told you how “good” you are, and “God to bless you and your family” ? He did not tell you that, like all other Kaffirs (a pejorative term meaning something like “dirt“), you are “unclean” (Koran 9:28), “the vilest of beasts” (8:22), on a level with faeces, urine, etc. (Ayatollah Sistani), made “apes and pigs” (5:60) ? He did not tell you that “Allah is the enemy of the unbelievers” (2:98), and that “he does not love the unbelievers” (30:45), and that the “excellent pattern“ praised in the Koran (60:4) is for there to be “between us and you animosity and hatred forever until you believe in Allah alone” ? He seems to be seriously misunderstanding his doctrines. You can be sure he has dutifully recited the Koran, and may even have memorised it. But, probably being of Urdu-speaking Pakistani background, he does not understand a word of ancient Quraysh Arabic, and has never been permitted to see a translation. New York, Heed Logan`s Warning. “this is what’s best for humanity”. This very thought motivated several centuries of European imperial colonialism. Shall we be surprised that now, non-Europeans want to do what Europeans were doing in the 14th-20th centuries? After prayerful consideration, I decided to ask you to please be my special guest on a date that we decide upon (6-8 pm eastern,M-F). No travel necessary! You just talk on the phone for the interview. Please watch us at http://www.justin.tv/lbn2live and http://www.libertybroadcastingnetwork.com/rpm. There you will also find a live chatroom. Below is the invitation letter, which I pray the you forward this to your trusted colleagues/friends who may want to be on the radio/internet television program. Greetings from the Radio Preacher Man in Lake City, Florida! I have been greatly blessed to serve Jesus in this late hour via my live-streaming internet (and radio) show at the Liberty Broadcasting Network, found at http://www.libertybroadcastingnetwork.com. I am providing my radio show and live-streaming worldwide internet broadcast as a “microphone” or “megaphone” to the wonderful, brave individuals who want the Constitution and our God-given freedoms of religion and free speech to survive and thrive. This is my gift to God and to my country. The name of my show is “REVELATIONS PER MINUTE” (RPM), and my handle is the “RADIO PREACHER MAN” (RPM, AGAIN!). Revelations per Minute airs on Monday thru Friday 6 to 8 pm EASTERN – prime time! We are really running out of time. PEOPLE ARE GOING TO DIE FOR LACK OF KNOWLEDGE. Americans, including Patriots and Christians, are confused or misinformed about the Truth. They are learning from false teachers and are grossly deceived. Because of this, many Americans are turning away from God in order to find the solutions to the myriad of problems in today’s world. I found your site and the researched it a bit, and I know that your knowledge and information could really save and souls and lives at this point in time. I would love to discuss all of your hard work and promote your site and materials, such as your books/DVDs (if applicable). I know that you would be a blessing to the audience/”congregation.” You can be on the show for the entire two hours (6-8 pm eastern), or just one, depending on your schedule. -All programs on LBN are broadcasted on 1710 am in the Minneapolis area, which is the 10th largest metropolitan area in the U.S.
With all of these avenues, we can evangelize and spread the TRUTH about many subjects that otherwise would be censored. Please respond to my email if you would like to be a guest. I will then coordinate a date/day with you. On the night of the broadcast, we will call you at 6:00 pm eastern, so please include the phone number that we should call. You can even use bluetooth so that you are not tied to you phone! Send any of your materials, such as books/dvds/workbooks to my address which is at the bottom of this letter. My motto is: “The light is in the SON! AMEN! May God Richly Bless You All! P.S. We need funding for this operation, and I want you to pray about it. If you want to support us with money, it’s super easy to do. There is a donate button on http://www.libertybroadcastingnetwork.com/rpm or you can send funds via paypal to moniquebaugus@hotmail.com. You can send checks, money orders, or gold/silver coins (for real!) to our physical address below. I apologize for the late reply, as I had not seen this comment. I will be contacting you shortly. You people are mentally ill and just plain pathetic. Is that supposed to be an argument based on any kind of substance? If so, your standards are awfully low. Mohammad was the mentality ill one. Now please explain what I should like about more and more of the world falling to Islam?